If I had to choose one thing to keep out of all my children's things it would be their books. There is just something special about them. Many were mine, passed down. With dates and notes from grandparents. Handwriting that will never be again. 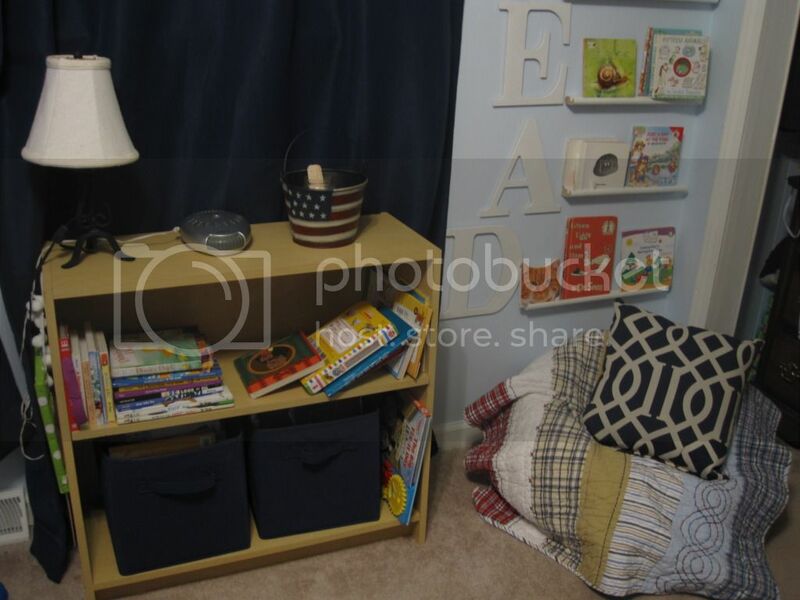 We have alot of books, and they require a storage solution that is simple for children to keep neat. I adored Luke's old room and the shelves we hung on the wall. And I knew that was happening again. STAT. We grabbed these "shelves" at Habitat Restore. I honestly have NO idea what they are? 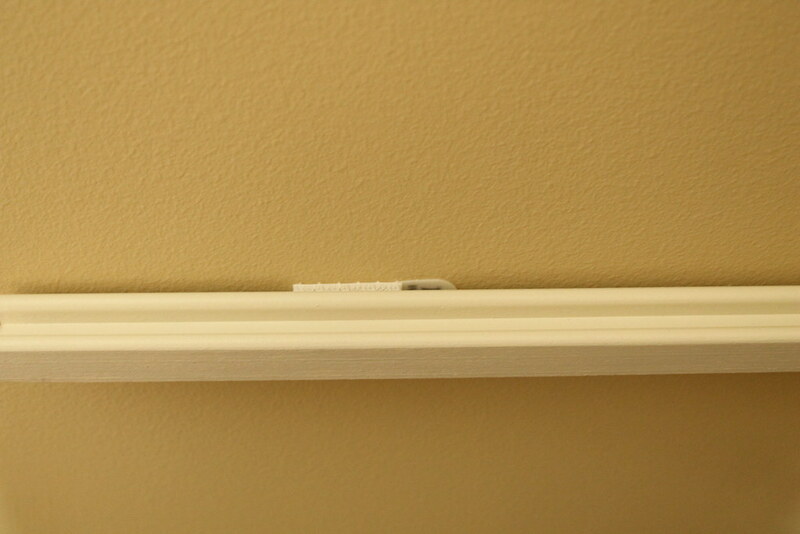 Moulding, trim? Not sure. But They were sold in huge bundles for 50cents. There were 2 kinds in the bundle. The ones we hung in his old room were rounded. We still have some of those leftover, but they were a pain to hang. They are currently being used as Luke's "speedbumps" in the garage when he rides his bike. I wanted to try the more square ones in the new playroom. They got a fresh coat of spray paint. We decided that instead of making holes in the wall that it would be best to use OnCommand strips. I figured if each strip holds 4lbs then 2 strips would hold 8lbs. Perfect sense. And children's books don't weigh 8lbs. My only worry was that the shelves would stick too far out from the wall. And although there is a gap it is only noticeable when you are standing right over it. Once they are loaded with books it's completely hidden. Obviously these shelves don't hold all their books- it's just a nice visual for the reading nook. A small selection are held in the striped basket on the floor. The other book collections are in their bedrooms. So far the OnCommand hooks are really working well! The lip on the shelves is so small it really isn't able to hold big thick books. 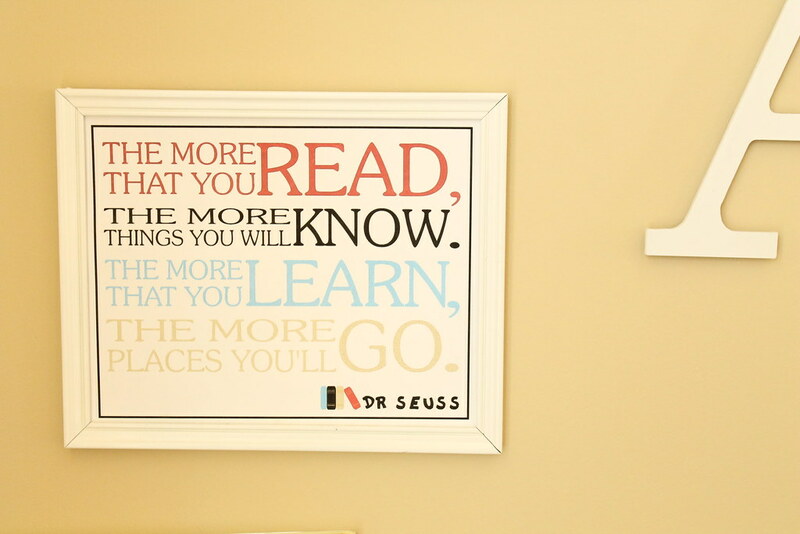 But that's okay because most children's books aren't that big! I am loving how this room is turning out! And I have the itch to paint!